For years, I have been noticing OBAGI Medical displayed in dermatologist offices and med spa waiting rooms, the Vitamin C has even been recommended to me before. To why I never bought anything in the past, given that I'm always mesmerized at the impressive lineup of products, I’m not sure. It seems now more than ever, there are so many products on the market, many have trendy packaging targeting the fruits or plants being buzzed about. They have innovative advertising and promotion, easily making their way into our hands via samples or Instagram. All of this makes them feel like they are already part of our life. I was slightly intimidated by the devotion that doctors displayed for OBAGI Medical, thinking it might not be user-friendly to someone who loves to layer all different products from all different brands, this was a huge beauty fail on my part. Once I delved into the product line of OBAGI Medical, the first thing that stood out to me was that many of their products are broken down into strength levels, vitamin-C 10%, 15%, 20%, which makes it so user-friendly! I’ve applied countless products, that have warnings of an adjustment phase, due to the strength of an ingredient, rendering my face red, raw, burning or flakey. To add insult to injury, I never end up reaping the benefits, because I’m so impatient I abandon the product as soon as I feel, or look uncomfortable. “Please mom, just try, it’s so gross you’re gonna puke!" I don’t want to try the sour milk or rotten egg jellybean from the beanboozeled game when I can get delicious flavored ones, that I will enjoy, down the street. I also don’t want to put products in my face that hurt or make me look worse until I get use to them when I can buy products that work to gradually strengthen my skin. In my entry to OBAGI Medical, I gravitated to the Vitamin-C. I decided that it made most sense to start at the lowest and work my way up in percentage so I could experience the full effect. Also, I didn’t know off-hand what the percent was in my other Vitamin-C products. 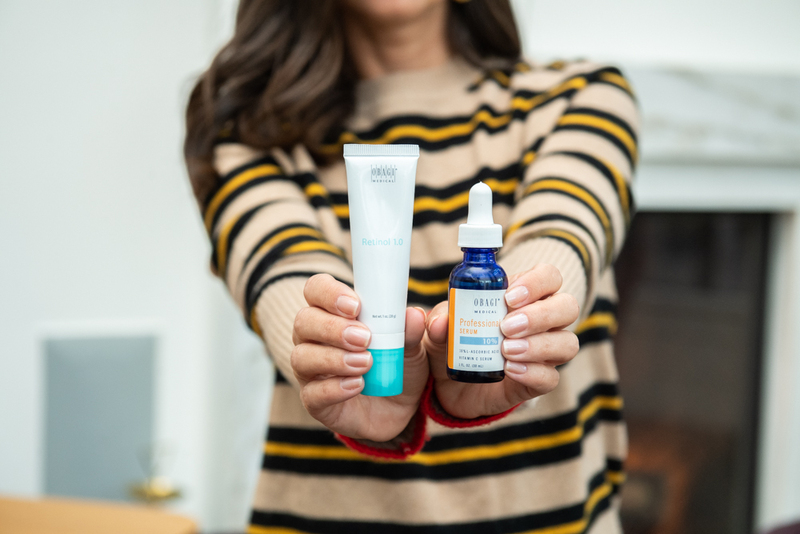 Well now, for brightening and an array of other satisfying skin solutions, Vitamin-C is one of my favorite products, but never before have I had immediate results like this, instantaneously rewarding me with every potential benefit I’ve ever read about. Used as my first layer, after I tone, my skin is impressively even and bright, as if I’ve never had a bad nights sleep, which is definitely not true. Soon after introducing my face to OBAGI Medical, I realized that I didn’t get any monthly outbreaks on my chin, I was missing those dehydrated fine lines, and I had to question whether or not I got filler to plump my cheek and forgot about it. I was in disbelief that in just a few weeks using the correct dosage, and my new favorite product, that it could improve my skin so much that I don’t even feel the need for makeup every time I leave the house. The other product I decided to dedicate myself to is the Retinol 1.0. No doubt that Retinol can turn back time, but often, it just takes too much time to see results. Slow working products make me feel like I’m stuck in traffic on the way to pick up my kids from school. “Come on, let’s go, don’t you care I have somewhere to be in a hurry!? !” I’m not really sure where my face needs to be, but it’s definitely not hidden under oversized sunglasses and a large hat due to irritation. OBAGI Medicals Retinol 1.0 did not have me stuck in an awkward phase of dry or irritated skin. In fact, it seems to hydrate and even out my face even more, making it a real short cut to youth. I’m sort of angry at myself for being intimidated by OBAGI Medical, thinking it was too serious for me. The serious thing about OBAGI, is that it seriously works for me!